Product #1082 | SKU 3-014-0002-X | 0.0 (no ratings yet) Thanks for your rating! 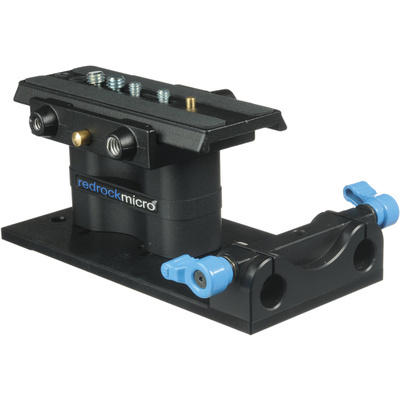 The Redrock Micro microSupport Baseplate (15 mm High Riser) is the foundation upon which your camera's rod/rail support system is based. This High Riser version adds extra height to your camcorder or DSLR when a 35 mm lens adapter, flip module or other accessory requires it for proper vertical alignment. Designed for use with industry-standard 15 mm rods, the professional-grade microSupport Baseplate provides rock-solid support for your camera, lens adapter, follow focus, and other accessories. Adjust your rig as needed, adding or subtracting accessories with ease, from front matte boxes to lens supports to rear-mounted power packs. Supports a variety of manufacturers' lens adapters.